Oscar Bravo Home: What Is My Home Decor Style? When it comes to home decor, most of us are influenced by many different styles we see around us. 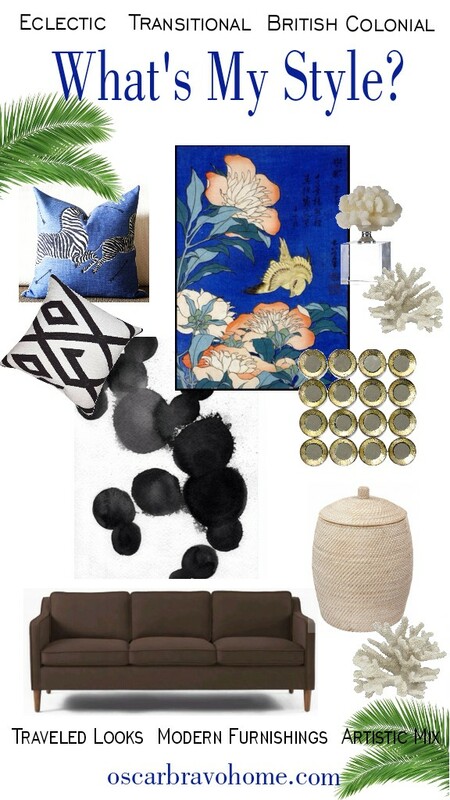 This can definitely be confusing, but being able to classify the decor we are attracted to will help us make sense of our unique style. In a nutshell: I like jewel-tones. I LOVE texture. I like a "traveled look". I love a good bargain. 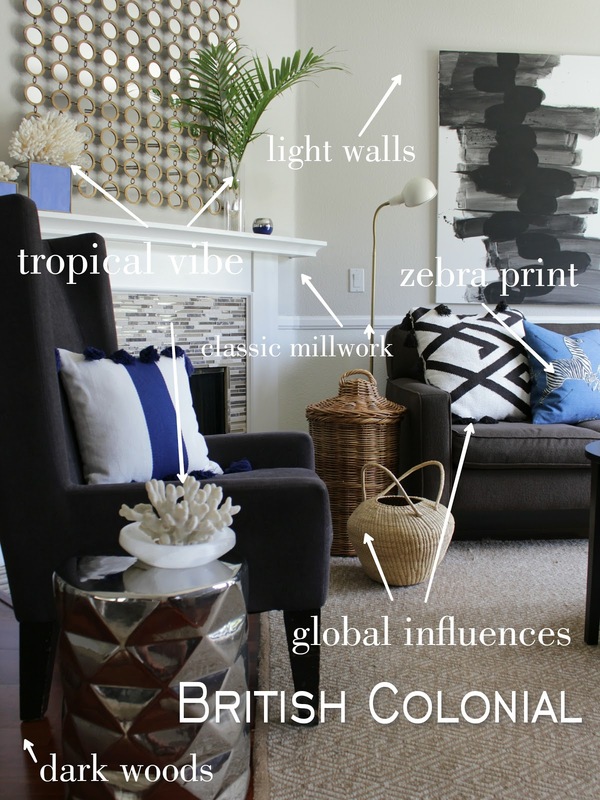 My 3 favorite home decor styles are BRITISH COLONIAL, TRANSITIONAL and ECLECTIC. British Colonial home decor started when the British Empire was at it's peak and colonists were traveling and exploring far off places and bringing home pieces to adorn their classic English homes giving their spaces a global, well- traveled and exotic look. Dark carved woods, teak and rattan, white walls, animal prints, and tropical botanicals are common in these British Colonial style homes. 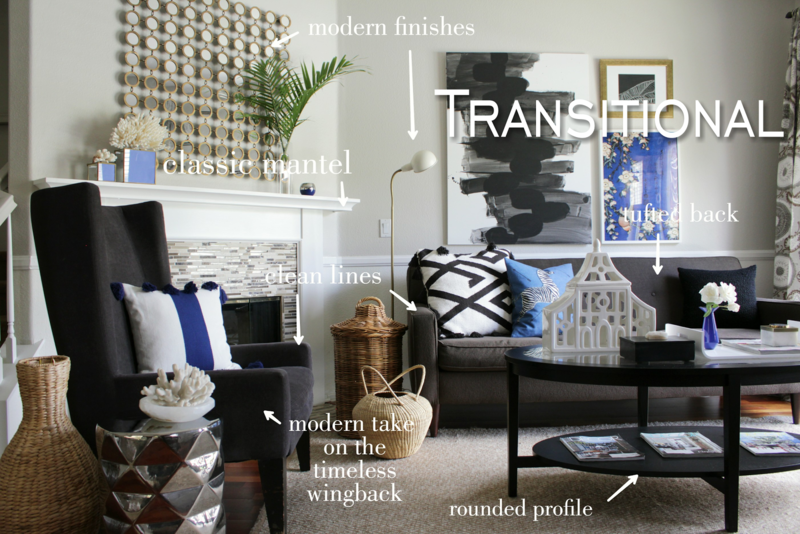 Transitional style is the perfect balance of classic and contemporary. The lines of the furniture have a nod to tradition but are streamlined for a more contemporary feel. Plush fabrics, nailhead trim, rounded shapes, geometric patterns and a harmonizing color scheme are all part of the Transitional style. 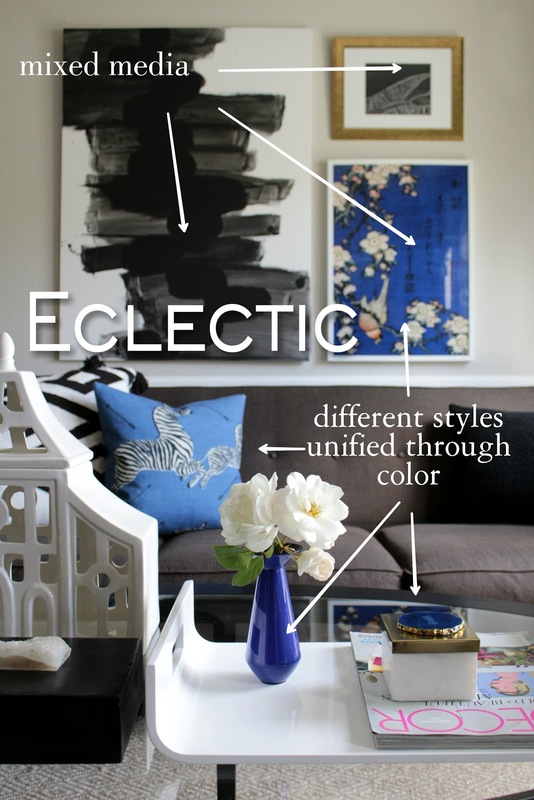 Eclectic style is an artistic mix of different styles. Mid-century modern with classic antiques, contemporary with industrial, soft and hard, masculine and feminine, really anything goes as long as it has intention and is tastefully done. The fun in an eclectic space is how the juxtaposition of items bring each other out. For example, in the picture above, the classic-styled crown moulding looks even more classic when combined with contemporary abstract art. This tension and contrast makes eclectic spaces interesting. Many times, Eclectic spaces are balanced and pulled together through the use of color. Now, take a peek in the homes of my blogger friends and see their mix of styles that makes their house a home. Next up is Ariel at PMQ For Two's bright and colorful space, go check it out! And here is a list of all participating bloggers. I love this post, Oscar! It's so informative, and full of gorgeous example pictures! You out-do yourself with each new styling job, my friend! Such a talent! OH MY GOODNESS! Oscar you knocked your first Home Style Blog Hop out of the park! Love how you dissected your home style (meanwhile.... I'm going to have to edit my post. lol) and I have always been drawn toward your style. The modern twists on british colonial style has always intrigued me. Beautiful post and home. Thank you so much for your kind words Stephanie! This was such a fantastic idea! I love learning about different styles so I can't wait to read everyone's post! you described your style so perfectly, oscar! i always love your home and styling, and loved hearing you put it all into words. and loving the blues right now! Thanks Cassie! I had a great time explaining it :) looking forward to checking your post out! I can guess already how you would describe your one of a kind style! Thanks for visiting the blog! Ok, first off, this space is AMAZING! 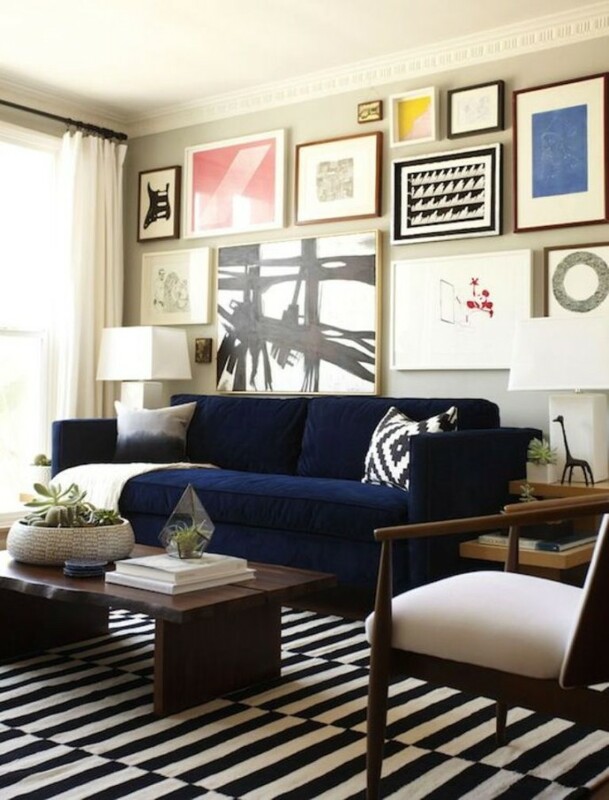 The pops of blues in your living room is pure inspiration!!! I love how you really described and dissected your style though. So informative but so interesting to read. Incredible job, Oscar! I love love love your home! I've been following you on insta for a while, and have always loved your use of colour. I'm glad to see I'm not the only one who unifies through colour. I've also got a total crush on your British Colonial style - classic! So so good, Oscar! 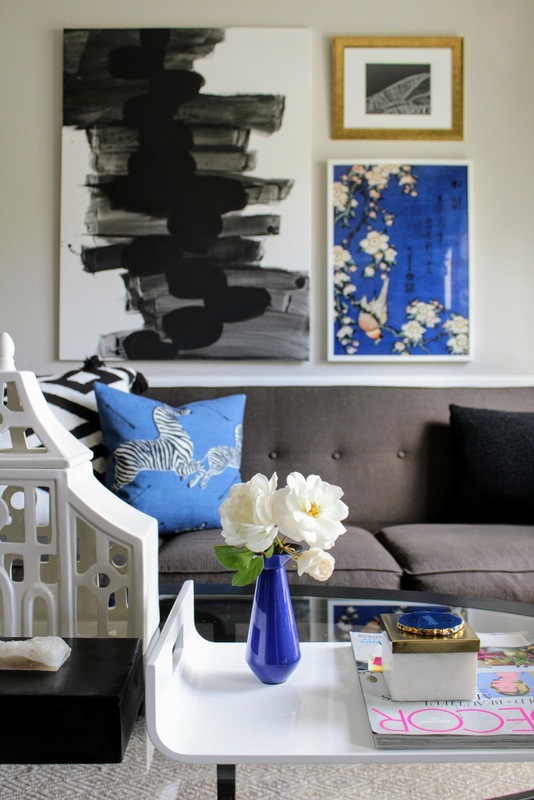 I love your large scale art, use of black and white and your awesome pattern play! I feel like we share some style similarities ;) Oh and I'm loving that rich and bold blue you have going on right now!!! I just adore your home Oscar. 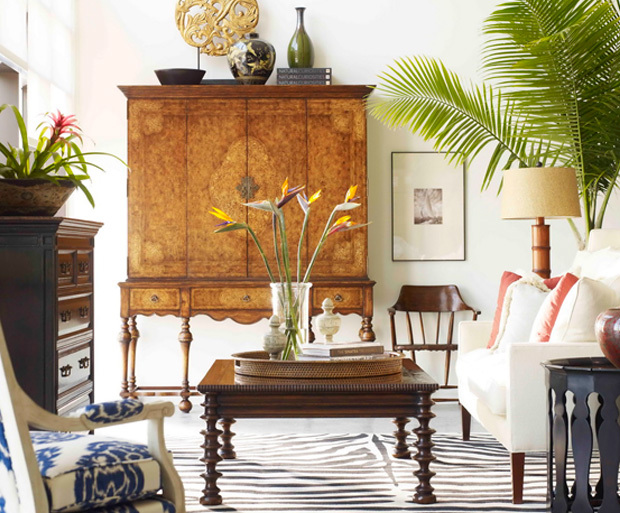 Your fresh take on British Colonial with modern traditional and global vibes totally speak to me. Love your use of a color to unify the different styles. Gorgeous.